Breaded Pork Chop Cutlets | Om nom nom! I am generally not a fan of breaded anything, but these were awesome and very simple. I brined the pork chops for a couple of hours before cooking, which really does make all the difference IMO, no matter what the cooking method (I’ve started doing it with chicken breast too, and get great results). 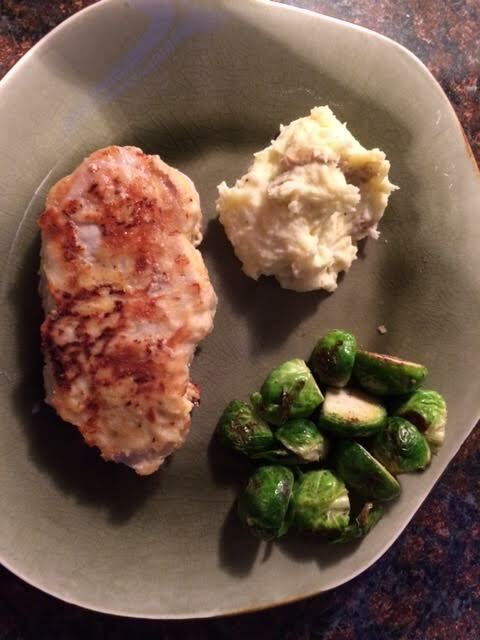 This is from this month’s Cooking Light, and we had it with mashed potatoes and brussels sprouts – we both loved it. Sprinkle pork evenly with 1/4 teaspoon salt and 1/4 teaspoon pepper. Place 6 tablespoons flour in a dish. Place egg in a dish. Dredge pork in flour; dip into egg. Dredge in flour again. Heat a large skillet over medium-high heat. Add 1 tablespoon oil to pan; swirl. Add 2 pork cutlets; cook 2 minutes on each side or until browned and done. Remove pork from pan; keep warm. Repeat procedure with remaining 1 tablespoon oil and 2 pork cutlets. Add stock, scraping pan to loosen browned bits. Combine remaining 5 teaspoons butter and remaining 2 tablespoons flour in a small bowl. Gradually add butter mixture to pan, stirring with a whisk. Cook 2 minutes or until thickened. Stir in remaining 1/4 teaspoon salt, 1/4 teaspoon pepper, and sage. Serve with pork and mashed vegetables.